When Ferdinand Porsche put together the prototype of the Volkswagen Beetle in 1933, he may not have recognized that he was creating one of the world's most iconic cars. After the end of WWII, the little Beetle found its way across the oceans of the world and soon, people in almost every country on the planet added their personal touch to the 'People's Car'. Porsche gave his new 'Wonder Machine' the classic outline of a beetle and this may have been a stroke of genius by a man who realized that humans have always had a love affair with these amazing creatures. Long before the ancient Egyptians lined the tomb of their pharaohs with these golden insects, primitive humans made tools and pendants that looked oddly similar to the general outline of a beetle. Their status as a reliable, abundant source of food during lean times meant that beetles were revered. Shamans and early medicine men saw them as elements of the gods, because beetles spent their days buzzing about in the skies. Beetles come in a variety of sizes and vibrant colors, making them the perfect accessories for the fashionista caveman, a trend that is still alive and well in today's fashion capitals. In the early 1900s, the Art Noveau Movement popularized jewelry made from bits of insects (including beetles) and in 2012, the Maquech Brooches became the new twist to an old trend by using live beetles embellished with precious stones and metals. Sales of both antique Beetle jewelry and Maquech Brooches have skyrocketed. Beetles have also caught the eye, and prayers, of those people seeking Divine intervention. By far, the most well known beetle to grace the surface of religious artifacts is the Scarab Beetle. Known as 'The Creator' or 'The Khepri' in ancient Egypt, Scarab Beetles were believed to be a representation of the Sun God and the way they rolled their dung ball across the hot desert sands was said to be a cosmic re-enactment of the ancient Sun god, Atum, pushing the sun across the vast sky. The Egyptian name for the Scarab Beetle (Kheper) translates into 'to come into existence and transform' and their connection with the Divine accounts for why important Egyptians like pharaohs and noble men were buried lots of Scarab Beetles and their tomb walls were filled with images of the insect in its spiritual quest to 'push the Sun across the sky'. Bejeweled Scarabs were wrapped in the mummified pharaoh's bandages in the belief that this would help him to reawaken in the land of the Dead and start his journey towards resurrection. Outside of the Egyptian spiritual realm, beetles became renowned as signs of good fortune. Ladybugs are common characters in children's stories and plays. Seeing one is believed to bring both a bountiful harvest and your true love to your feet. Many non-profits that promote tolerance and peace use the image of an adorable Ladybug to easily convey their message. However, if you're not interested in rocking the latest crawling accessory, you can always sport a beautiful Beetle Tattoo. Who knows, it might bring your soul mate to you. From the delicate contours and vibrant colors of the Ladybug to the strong outline of the Scarab Beetle, these tattoos come in all colors and sizes. Whether or not you add other elements to your design depends largely on the type of beetle you want to on your body. Scarab Beetle Tattoos tend to have elements that can easily be identified as ancient Egyptian symbols of authority (images of The Eye of Ra or The Ankh) whereas it's more likely that Ladybug Tattoo designs are brimming with feminine elements like flowers, fairies, or dragonflies. It's hard to picture ancient Egypt and the famous tombs of her pharaohs without the iconic image of the Scarab Beetle. From tomb walls and chariots to official seals, the Scarab Beetle was a reminder of the pharaoh's divine power to the ordinary citizens. Scarab Beetles are totems of Atum, the creator god and represent a connection to the powerful forces of Creation, Renewal, and Transformation. Scarab Beetle Tattoos are closely linked with spirituality and the Divine. Ladybugs bring Lady Luck whenever they fly by. Legend has it that you'll have luck and prosperity if a ladybug lands on you. The Irish believe that these little beauties offer protection and farmers are overjoyed whenever they see ladybugs in their fields. But ladybugs not only bring luck, they also bring love. In Asia, if you release a ladybug that you've caught, then she will fly directly to your true love and guide him back to you. Ladybug Tattoos represent Love, Luck, and all life's richest blessings. These tattoos are for Flower Power children and are more often embodiments of your love for Nature. Tribal patterns from various indigenous cultures represent traits and symbols that are unique to that particular culture. Although the exact meaning of each pattern is shrouded in mystery, tribal patterns are often linked with the cultural and spiritual elements of the native people. It's not uncommon for natives to depict animals using specific tribal markings as a way to draw spiritual power from these animal totems. 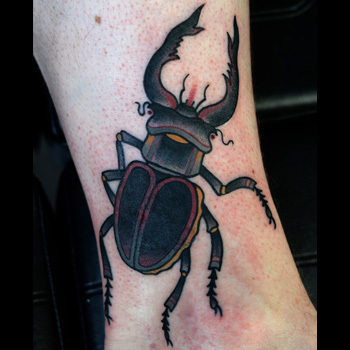 A Tribal Beetle Tattoo enables you to identify with a specific culture and bring the unique traits of the beetle (Luck, Love, Prosperity, a connection with the Divine) to you, the wearer. Choosing the right tattoo design isn't as daunting a task as you would imagine. When it comes to selecting the perfect design, there are a few basic questions to ask you. What will this new artwork symbolize? Where will you place it on your body? Will you combine it with other design elements for an overall look and feel? Your new ink can't be erased with a Mr. Clean Magic Eraser, so it's best to take your time to get things right. For inspiration, visit our design page at If you need some inspiration, then visit our design page at www.itattoodesigns.com and take advantage of our Custom Tattoo page. Together with the iTattooDesigns team, you can cook up a piece that'll be truly one-of-a-kind.